On The Ice . . .
Jan and I left the rig about 10:30, heading for our daughter Brandi’s down in Katy for the afternoon. We were going to be attending Landon’s Ice Hockey classes at the Sugarland Ice and Sports Center after meeting up at Brandi’s. One thing new this trip was that my Garmin GPS was suddenly routing us using the Grand Pkwy Toll Road instead the Sam Houston Toll Road that we’ve always taken. So why the sudden change? It wasn’t doing that when we left here on our western journey last March. Then I remembered that while we were out west, I had done an update on our Garmin, so I guess that’s it. Now on the surface the Grand Pkwy looks a little better, but only about 4 miles better, the mileage difference between the Sam Houston Route and Grand Pkwy Route. But those 4 miles come at a cost. When we take the Sam Houston we go through 2 toll booths at $1.75 each, for a total of $3.50 one way. But the Grand Parkway is somewhere between $8 and $9. It’s hard to tell because of the strange pricing at the toll booths. Where tolls on the other toll roads around Houston are $1.00, $1.50, or $1.75. But the GP is just weird. What the heck kind of toll is $1.11? So twice as much in costs for a 4 mile savings. Not really worth it. At least for that savings. But it is worth it in one case. And that’s when we’re leaving Brandi’s on a weekday afternoon rush hour heading back to Lake Conroe. Heading in toward Houston on I-10 and then around on the Sam Houston isn’t too bad. But then you get on I-45N on the way to Conroe. And it’s pretty a dead stop at that point. In fact, one time, the normally hour and 15 minute trip took us almost two and a half hours. So that’s when the Grand Parkway route comes into its own. Getting closed to Brandi’s we took a loop out by the Hamilton Metal’s rig count sign and found the count had not increased since last week, still showing 952. At least it didn’t go down. I suspect the holiday period might have something to do with it. Jan and I rode down with Lowell and Landon, and we all met Brandi at the rink about 1:15. First up was to get Landon dressed in all his paraphernalia, kind of like a squire dressing a knight. Then we were up in the stands while Landon got out on the ice. The coaches ran the kids through a number of different exercises, skating forward, skating backwards, stopping, fighting for the puck, hitting the puck into the goal, etc. There were three girl players among the group. Here’s one. And here’s the other, standing to the right of Landon whose in the middle. The pony tail is a dead giveaway. Her jersey is so long on her that its almost like a dress. But, as they say, looks can be deceiving. Both of these young ladies, and the third one, are really good skaters. As good or better than most of the boys. Landon has really improved since we saw the video of his earlier lessons, and he’s really enjoying his classes. Leaving the rink, Brandi headed off to a baby shower while Lowell, Landon, and Jan and I drove right down the road to Floyd’s Cajun Seafood. There are now five Floyd’s Cajun Seafood, four in the Houston area and one in Beaumont. And up until now it’s the only one we haven’t eaten at. We all had the Chicken Fried Chicken. Well, all, except for Landon, who didn’t want anything except a Dr. Pepper. But I also started out with a cup of their delicious Seafood Gumbo, probably the best outside Louisiana. And then it was on to the CFC. If you ever go to a Floyd’s, try the CFC. Yeah, I know it’s a Cajun Seafood place, and that’s all delicious too. But just try the CFC. And like we do. Order it with the gravy on the side, and then cut the CFC up into strips and then dip it AND the French Fries in it. You will not be disappointed. Thought for the Day: The Light of A Thousand Suns . 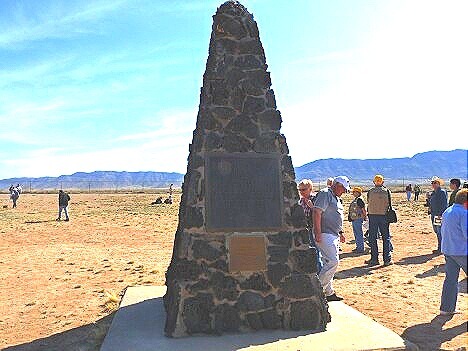 . .
Today, July 16th, is the 72nd anniversary of the first atomic bomb explosion in 1945. Two days a year, once in the spring and once in the fall, the government opens up access to Trinity Site and allows visitors in for a look-around. made the trip over to tour the area. So I thought I repost our visit in today’s blog. We got up at 6:30am this morning (man, that’s early!) and after grabbing breakfast at the hotel, we headed about 85 miles south of Albuquerque to the town of San Antonio, NM. San Antonio is the jumping-off place to Stallion Gate, the northwest entrance to White Sands Missile Range (WSMR) and Trinity Site. I used to enter WSMR thru this gate back in the early 80’s when coming back from White Sands Test Facility (WSTF) in Los Cruces when I was working for NASA. But before we left San Antonio I stopped and filled up at the one and only gas station in town. We had read that they also have fantastic homemade fudge, and it looked great. So we decided to stop back by on our way out of town. After making the 12 mile drive out to SR 525 we turned south and entered Stallion Gate about 3 miles later. They had people handing out directions and security guards checking I.D. Then it was another 14 miles out to Trinity Site itself. Along the way we came across this sign several times. If I hadn’t seen this sign in 2007 when we visited the WSMR Missile Museum I would have been very confused. This is an Oryx. And Oryx are native to Africa, specifically the Kalahari desert area. So what the heck were they doing here? It turns out that in late 70’s, 93 Oryx were brought over from Africa and their offspring were introduced into the White Sands Missile Range. 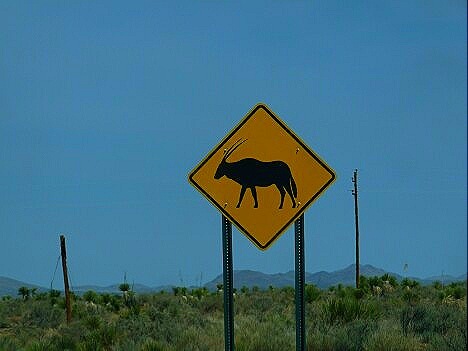 They were expected to stay on the Range, but apparently the Oryx didn’t read the signs and they began to wander far and wide as now animals have been spotted from 60 miles south of Albuquerque all the way down to West Texas. And without any natural predators their population exploded. 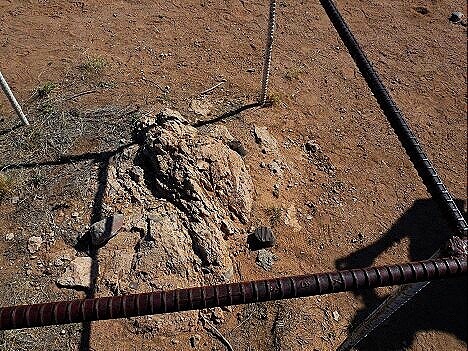 The coyotes and mountain lions in the area were no match for the large antelope with their razor-sharp horns. Someone then looked at importing the Oryx’s natural enemy. But this came to a screeching halt when it was discovered that the Oryx’s natural enemy were lions. And no one could get the lions to promise to stay on the Range either. So now there are over 5000 Oryx in the White Sands area, more than there are in the Kalahari. It’s not smart to mess with Mother Nature. Arriving at the Trinity Site parking area about 10 am, we found a large number of visitors already there. Making our way to the entrance, we encountered Jumbo. 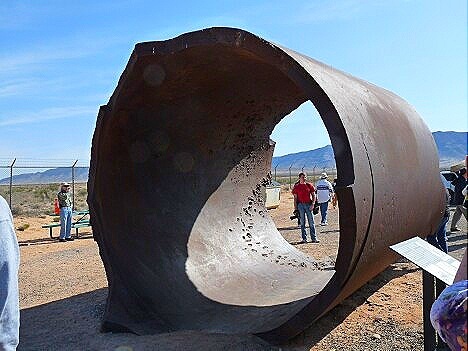 Originally it was 25 feet long, 12 feet in diameter, and weighed 214 tons! This is what it looked like 1945. Before testing the first A-bomb, called Fat Man, scientist were worried about whether the bomb would actually work the first time. The bomb was to be triggered by a large conventional explosion which would then trigger the chain reaction. But, if the chain reaction didn’t occur, they didn’t want the precious plutonium scattered all over the area. 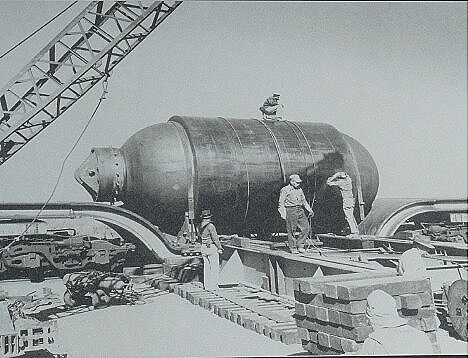 But by the time of the first test, scientist were more confident of the bomb’s success, and Jumbo wasn’t used. Later the Air Force detonated 8 500 pound bombs in Jumbo, blowing out the ends as seen here. Next we made the 1/2 mile walk to the fenced-in area of Ground Zero itself. There in front of us was the marker commemorating the first A-bomb. 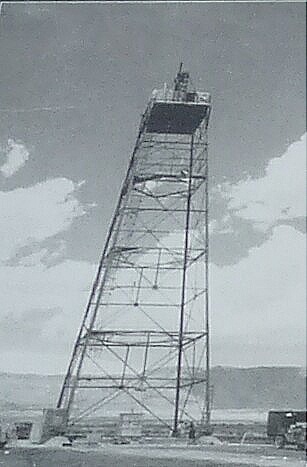 Nearby are the remains of the 100 foot tower that held the bomb before the test. This shows what a 10 million degree fireball will do to solid steel. And here’s what the tower looked like before. 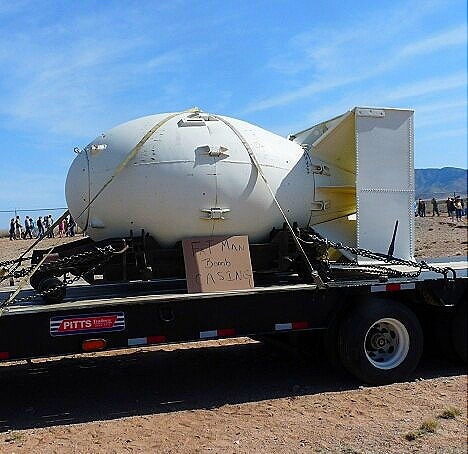 Also inside the fenced area was a mockup of the Fat Man bomb itself. There’s a joke here, but I won’t go there. 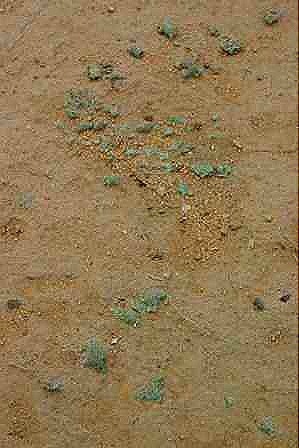 Ground Zero is littered with Trinitite, a green rock/glass, created by the searing heat as it fused the sand into glass. It is a Federal Offense to remove any of this from the area. It’s also slightly radioactive. 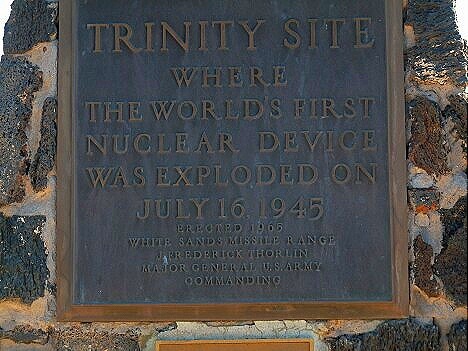 Trinity Site is an eerie place to visit. It’s hard to imagine the destructive forces unleashed here, even hotter than the surface of the sun. On the other hand, it’s hard to tell anything ever happened here. The scrub grass looks the same here as it does miles away. There is no crater remaining. In fact the original crater was only about 4 feet deep and 240 feet in diameter, more of a small depression, rather than a distinct crater. The observers were in a bunker about two miles away when the bomb went off. 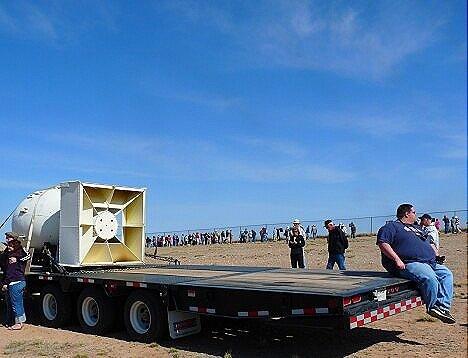 Windows were blown out 120 miles away and the shockwave was felt 160 miles away. Other observers, 10 miles away, said they could feel the heat, like opening up an oven door. 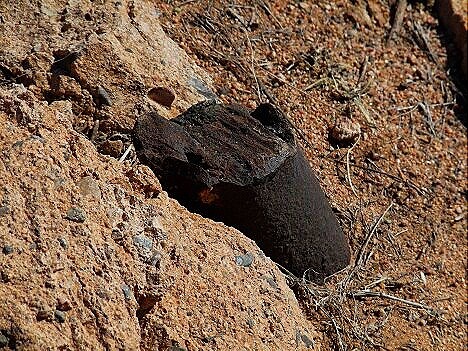 To conceal the test, the Army said that a munitions storage area had accidently exploded at the Alamogordo Bombing Range. The secret wasn’t revealed until the atomic bomb was dropped on Hiroshima on August 6th. Leaving the site about 11:30 am, we were glad we had come early. 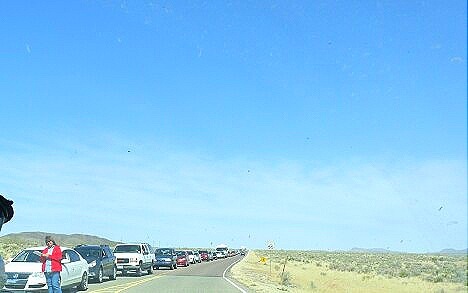 There was a solid line of cars, about a mile long, lined up at the gate waiting to get in. I don’t know if I’ve mentioned it before, but I may only be here because of the bombs dropped on Japan. My mother was Chief of Nursing at West Point, and she and her nurses were boarding trains bound for New Orleans in August 1945. There they were to board ships heading to the Pacific to support the invasion of Japan. Called “Operation Downfall”, the War Department estimated as many 4 million American casulties with 800,000 deaths, while 5 to 10 million Jananese DEATHS were expected. However the two atomic bombs that were dropped on Hiroshima and Nagasaki killed about 100,000 total.